These are celebration parties with a difference. 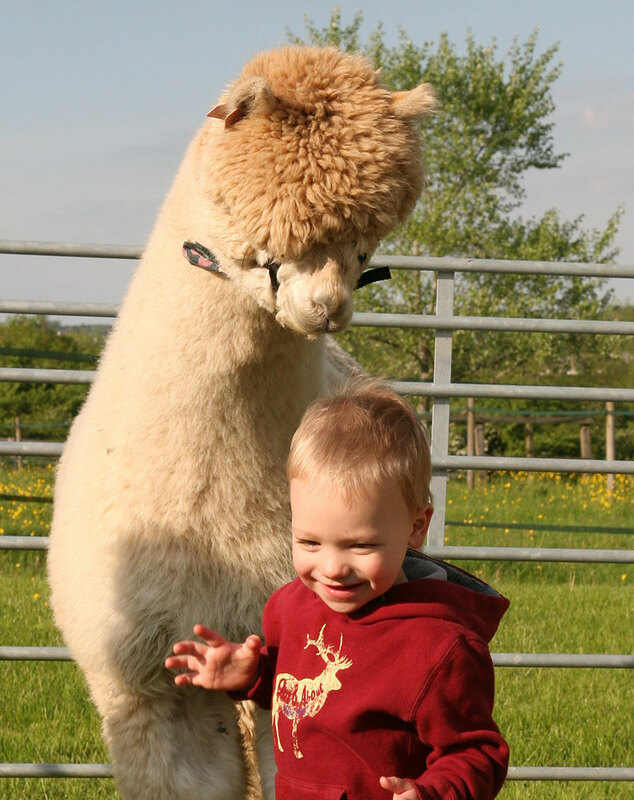 A never to be forgotten experience of getting up close to the alpacas with an opportunity to stroke and handle them. During the first session we introduce the idea of respect for the animals by feeling what it is like to be an alpaca on a lead before going on to meet the animals in person. 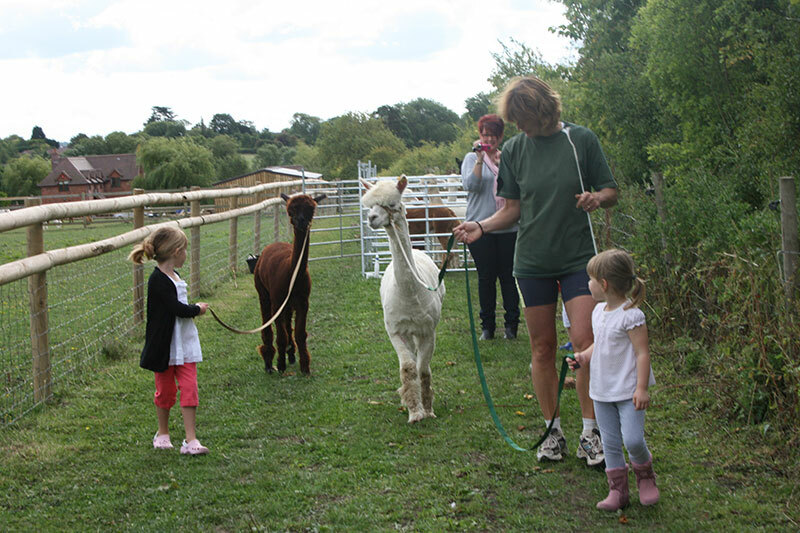 Then we use those skills to guide them around our own "Alpaca Challenge Obstacle Course" or take them for a stroll around the fields - alpacas are really curious and love the chance to get out and about. Back in The Studio we can get stuck into having some fun with some of the alpaca's fibre, trying out the craft of felt-making and making something to take home with you. Following that we can sit down to hearty but healthy party food. Check out the party packages and if there is anything missing for you we can be flexible and are willing to discuss individual requirements. Please feel free to contact us. In the event of wet weather, we can handle the animals under cover in the barn. Clean wellingtons are recommended and don't forget warm outdoor wear if necessary. Alpaca soft toy and certificate for the principal child. *Prices are based on a minimum of four and a maximum of ten children from the age of 6 upwards. Adult helpers must accompany children aged 6-8years at a minimum ratio of 1per 4 children. Children under 5years old can come for free with accompanying adult as part of a paying party. We are flexible and willing to discuss individual requirements.Please feel free to contact us. *Prices are based on a minimum of four and a maximum of ten children from the age of 6 upwards. Adult helpers must accompany children aged 6-8years at a minimum ratio of 1 per 4 children. Children under 5 years old can come for free with accompanying adult as part of a paying party. **A minimum of two weeks’ notice is required to prepare the cake and party bags. We are flexible and willing to discuss individual requirements. Please feel free to contact us. All dishes are home produced using fresh, local (where possible), non GM ingredients. Here is an example of the type of cake that I can produce for you. This is an all butter sponge made with free range eggs, decorated with chocolate and vanilla butter icing. It is set on a 12 inch board. 5-8year olds: Chequerboard sandwiches, apple and pork sausage rolls, tuna and sweetcorn mini pittas, vegetable sticks, cheese straws, mini funny face pizzas, tortilla chips, cheesy potato wedges, chocolate covered fruit kebabs, mini cup cake selection, whoopie pies. 9-12 year olds: Filled pittas, barbeque chicken wraps, glazed sausages, corn chips, fresh vegetable kedabs and dips, spanish tortilla wedges, cheese and bacon stuffed potato skins, cheese straws, chocolate dipped fresh fruit, mini fruit cheesecakes, raspberry clouds. Selection of fresh fruit juices and water, (tea and coffee for mums, dads, grand parents and helpers). We are flexible and willing to discuss individual requirements. Please feel free to contact us.